Nichiren Buddhism (日蓮系諸宗派: Nichiren-kei sho shūha) is a branch of Buddhism based on the teachings of the 13th century Japanese monk Nichiren (1222–1282). Nichiren Buddhism is a comprehensive term covering several major schools and many sub-schools, as well as several of Japan’s new religions. Various forms of Nichiren Buddhism have had great influence among certain sections of Japanese society at different times in the country’s history, such as among the merchants of Kyoto in Japan’s middle ages and among some ultranationalists during the pre-World War II era. Nichiren Buddhism is generally noted for its focus on the Lotus Sutra and an attendant belief that all people have an innate Buddha nature and are therefore inherently capable of attaining enlightenment in their current form and present lifetime. It is also noted for positioning itself in opposition to other forms of Buddhism and an evangelical streak as evinced by some schools’ practice of shakubuku, efforts to convert others by refuting their current beliefs and convincing them of the validity of Nichiren’s teachings. Nichiren Buddhists believe that the spread of Nichiren’s teachings and their effect on practioners’ lives will eventually bring about a peaceful, just, and prosperous society. From the age of 16 until 32, Nichiren studied in numerous temples in Japan, especially Mt. Hiei (Enryakuji) and Mt. Kōya, in his day the Japanese centers of Buddhist study, in the Kyoto–Nara area. He eventually concluded that the highest teachings of Sakyamuni Buddha (563?-483?BC) were to be found in the Lotus Sutra. The mantra he expounded on 28 April 1253, Nam-Myōhō-Renge-Kyō, expresses his devotion to that body of teachings. During his lifetime Nichiren stridently believed that the contemporary teachings of Buddhism taught by other sects (particularly Shingon, Nembutsu, and Zen) were mistaken in their interpretations of the correct path to enlightenment and therefore refuted them publicly and vociferously. In doing so, he provoked the ire of the country’s rulers as well as the priests of the sects he criticized and was subjected to persecution, including an attempted beheading and at least two exiles. Some Nichiren schools see the attempted beheading incident as marking a turning point in Nichiren’s teaching, since he began to inscribe Gohonzon and wrote a number of major doctrinal treatises during his subsequent three-year exile on Sado Island in the Japan Sea. After a pardon and his return from exile, Nichiren moved to Mt. Minobu in today’s Yamanashi Prefecture, where he and his disciples built a temple, Kuonji. Nichiren spent most of the rest of his life here training disciples and looking after lay believers. Today, Nichiren Buddhism is not a single denomination (see following lists). It began to branch into different schools within several years of Nichiren’s passing, before which Nichiren had named six senior priests(rokurōsō) whom he wanted to transmit his teachings to future generations: Nisshō (日昭), Nichirō (日朗), Nikō (日向), Nitchō (日頂), Nichiji (日持), and Nikkō (日興). Each started a lineageof schools, but Nichiji eventually travelled to the Asian continent (ca. 1295) and was never heard from again, and Nitchō later in life (1302) rejoined and became a follower of Nikkō. The reasons for the splits are numerous, entangled, and subject to different interpretations depending on which school is telling the story; suffice it to say that the senior priests had different understandings of what Nichiren’s lifetime of teaching was about. Although the former five remained loosely affiliated to varying degrees, the last—Nikkō—made a clean break by leaving Kuon-ji in 1289. He had come to the conclusion that Nikō and the others were embarking on paths to heresy that he could not stem. Kuon-ji eventually became the central temple of today’s Nichiren Shu, one of the two largest branches and the one encompassing the numerous minor schools of the Minobu branch into which most of the schools started by Nisshō, Nichirō, and Nichiji have been subsumed. The other dominant branch is centered at Taiseki-ji, the head temple of today’s Nichiren Shoshu school. Taiseki-ji, which Nikkō founded in 1290 after leaving Kuon-ji, was the starting point for the other schools of the Kōmon-ha (興門派, kō from Nikkō) or Fuji-ha (富士派, from the locality) branch. Other traditional Nichiren schools include several sub-schools that call themselves just Hokke Shū, the Honmon Butsuryū Shū, and the Kempon Hokke Shū. Several of Japan’s new religions are also sub-sects of or otherwise based on one or another of the traditional Nichiren schools. The Reiyūkai, Risshō Kōsei Kai, and Nipponzan Myōhōji Sangha stem from one or another of the Kuon-ji/Minobu branch schools, whereas Sōka Gakkai, Shōshinkai, and Kenshōkai are breakaways from the Nichiren Shoshu school. The following lists are from the Japanese article on Nichiren Buddhism. Head temple names are given in roman letters only when the reading could be confirmed. Japanese characters preceded by «ja:» link to articles in the Japanese . Though most sources (e.g., ; Illustrated, p. 1443; Cambridge, p. 175; Iwanami, p. 679) characterize Sōka Gakkai as one of Japan’s new religions or as a lay organization of Nichiren Shoshu, it is no longer affiliated with the latter. SGI and its constituent organizations position themselves as lay organizations whose purpose is to support practitioners of Nichiren Buddhism. Much of Nichiren Buddhist doctrine is, at least on the surface, a further development or adaptation of Tendai (Chinese: Tiantai) thought, especially as passed down from Saichō (also known as Dengyō; 767–822). For example, as in Tendai but in contrast to many other Buddhist schools, most Nichiren Buddhists believe that personal enlightenment can be achieved in this world within the practitioner’s current lifetime (即身成仏: sokushin jōbutsu). Markedly different from Tendai and any other Buddhist lineage is the Nichiren Buddhists’ practice of chanting daimoku, the repeated recitation of the mantra (phrase) Nam-Myōhō-Renge-Kyō, in some denominations also pronounced Namu-Myōhō-Renge-Kyō. Most Nichiren schools also recite the Lotus Sutra (in Japanese pronunciation of the Chinese text) to varying degrees in their respective versions of the often daily or twice-daily gongyō service. Other details of Nichiren Buddhist practice can differ widely depending on the school. Some recite the whole Lotus Sutra, while others recite only certain chapters, parts of chapters, or verses. 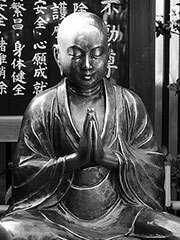 Some worship Buddhist statues or images and the Gohonzon, a mandala Nichiren provided for his followers during his lifetime; others worship only statues or images of various types; whereas yet others venerate only a particular Gohonzon and transcriptions of it. Some schools (chiefly those stemming from Kuon-ji) keep Shinto shrines in their temple compounds and permit or encourage worship of indigenous Japanese deities, while those stemming from Taiseki-ji tend to be very strict about their prohibition against worship of anything other than the Gohonzon or even the mixing of doctrines from other schools. Some schools are virulently nationalistic; others are not and are further strictly pacifist. Further, Nichiren Shoshu and other schools stemming from the priest Nikkō consider Nichiren to be the True (or Original) Buddha, whereas Nichiren Shu and the others descendant from the other six senior priests see him as a saint, great teacher, or prophet. To understand these differences, readers are urged to look for information on the particular school or schools in which they have an interest. Nichiren was a prolific writer. His personal communications and writings to his followers as well as numerous treatises detail his view of the correct form of practice for the Latter Day of the Law (Mappō); lay out his views on other Buddhist schools, particularly those of influence during his lifetime; and elucidate his interpretations of Buddhist teachings that preceded his. These writings are collectively known as Gosho (go is an honorific prefix designating respect; sho means writings) in some schoolsand go-ibun («left-behind writings») in others. Over 700 of them, some complete and some only in fragments, have been passed down through the centuries in compilations, as copies, and even many in the original. Some are also available in English translation, most notably in Letters of Nichiren and Selected Writings of Nichiren in the Translations from the Asian Classics series from Columbia University Press; more-sectarian translations of some of his writings are also available. Full disclosure statement: Although Soka Gakkai retains the copyrights on the foregoing three works and financed their publication, they show some deviation from similar works published under Soka Gakkai’s own name. Shimpan Bukkyō Tetsugaku Daijiten (新版　仏教哲学大辞典: «Grand dictionary of Buddhist philosophy, rev. ed.»). Seikyo Shimbunsha, 1985. No ISBN.